I was looking through all my stuff the other day and came across a huge wooden clothespin I got at a craft store a couple of years ago. I always thought it would make a great recipe card holder. So that's what I did! 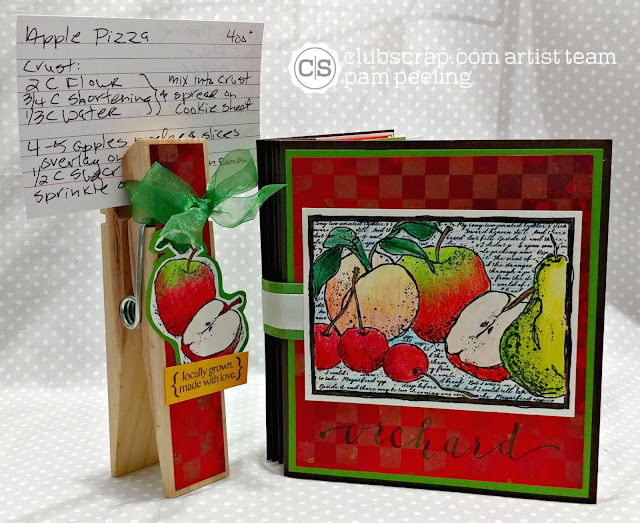 I decorated the clothespin and made a recipe book to go with it. 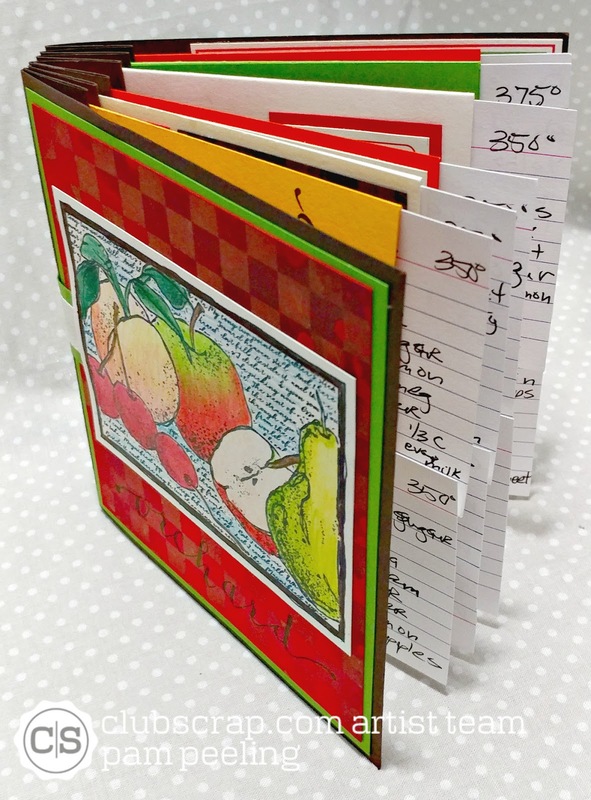 The finished recipe book measures 5 1/2" x 6". There are 12 folders that hold recipe cards. 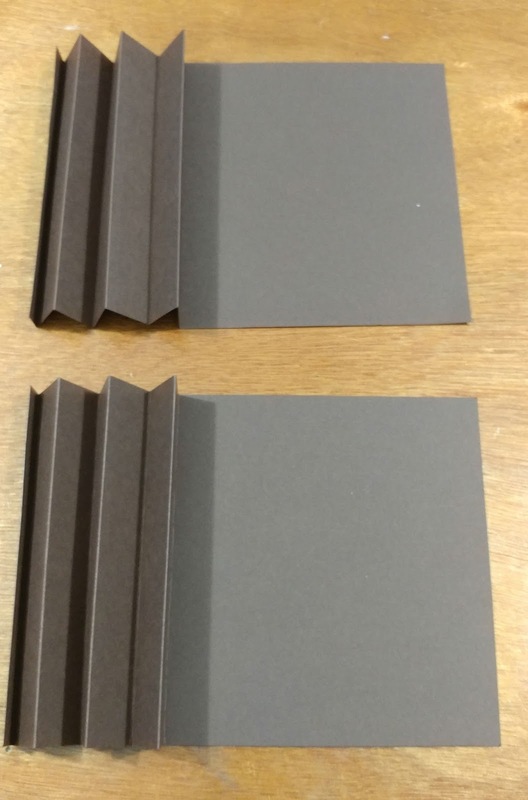 The book has an accordion folded spine. Inspired by this month's kit I included only recipes made with apples, pumpkin and cherries. 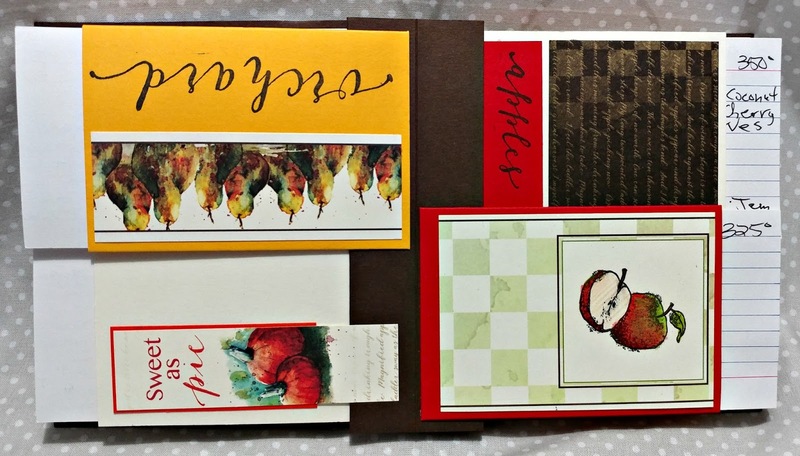 I decorated the folders with papers and embellishment cut-aparts from the Orchard collection. 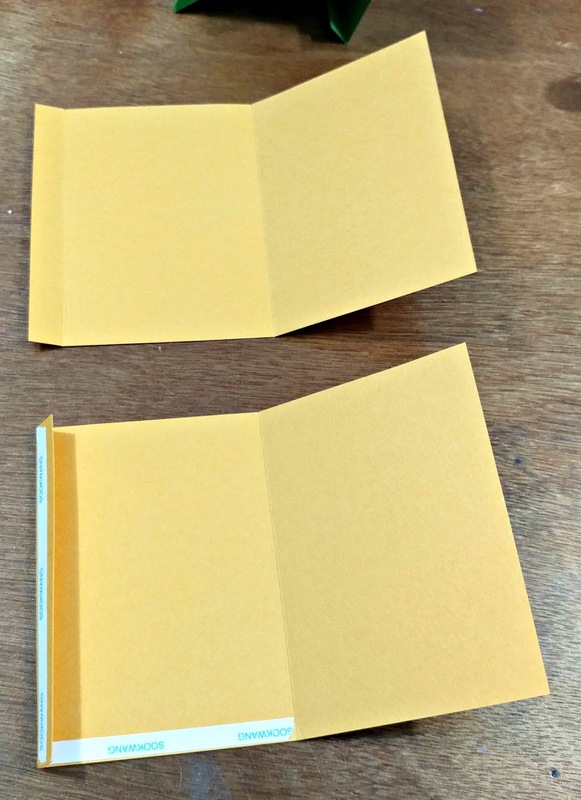 To make this cut 2 pieces of card stock for the front and back cover 6" x 12." Score it @ 5 1/2", 6 1/2", 7 1/2", 8 1/2", 9 1/2", 10 1/2" and 11 1/2". 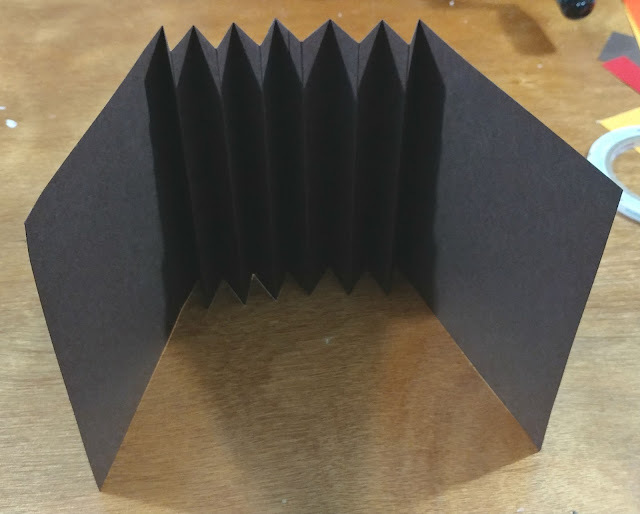 Fold in an accordion pattern. Adhere them together overlapping one of the 1" accordion ends. For the recipe folders cut 12 pieces of card stock 4 1/2" x 6 3/4". Score at 1/2" and 3 5/8". Put tape on the edges as shown and fold over into tube open on one edge. 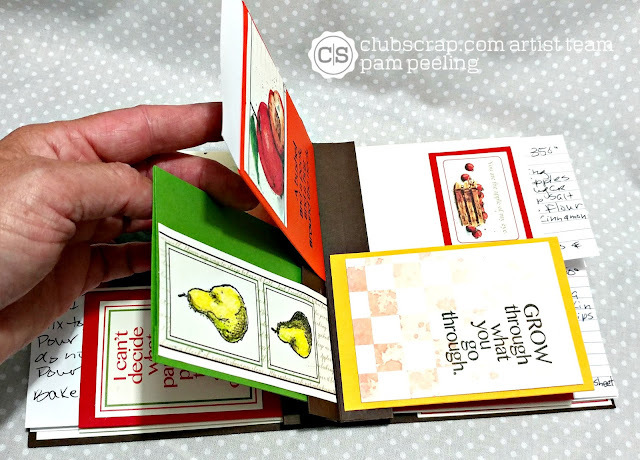 3"x 5" recipe cards fit perfectly! 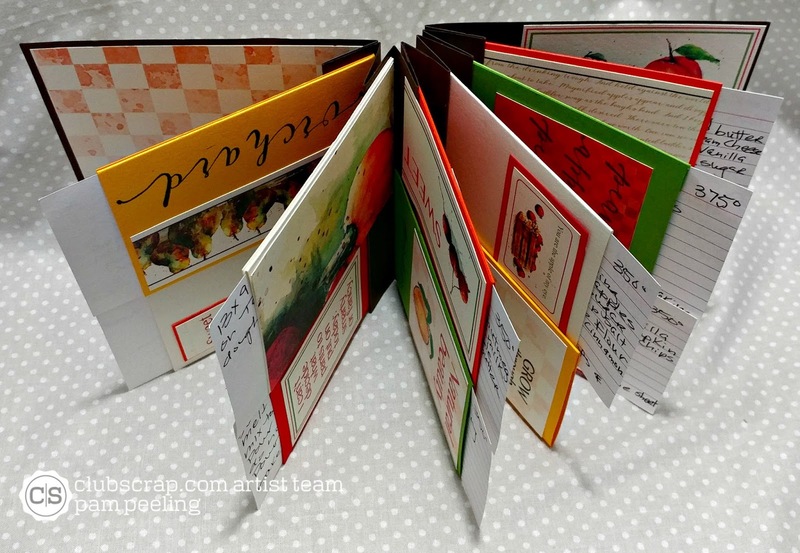 Adhere each of the folders onto the accordion folds of the book. I adhered 2 to each accordion-one on one side and then one to the other side-staggered so they are next to each other. I adhered a ribbon across the back to hold the book together. 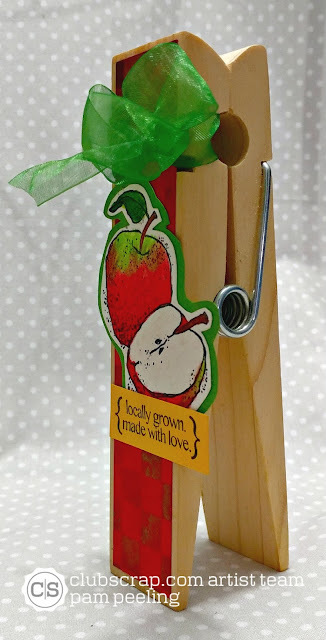 For the giant clothespin I just decorated the front with paper, ribbon and unmounted rubber stamped images from the Orchard deluxe kit that I colored in with Prismacolor colored pencils. Your next stop on the hop is Hetty! Love your recepi book, looks delicious!! And that large peg is stunning and super idea! WOW, Pam this is a fabulous idea!! Love how the recipe cards peek out at you!! And I have always thought about buying one of those big clips!! Love this!! Such a nifty idea! Looks like such a fun ensemble gift idea...I have a couple of those cloths pins too ;) I need to dig em out and get busy! LOVE the coloring on the apple image on the giant clothespin...well done! 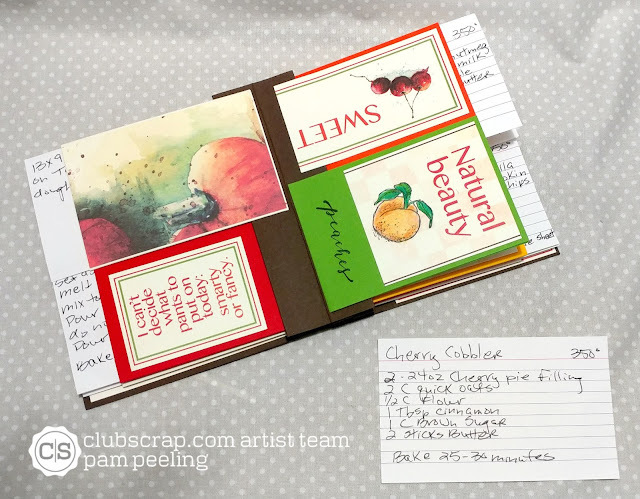 Your recipe book is a great idea and would make a wonderful gift for a bride or new mother! Repurposing looks good on that giant clothespin! The binding is so clever and the pockets are ingenious! Well done Pam! very cute project and very usable. Great use of that awesome huge clothespin, and now it's decorated so well. 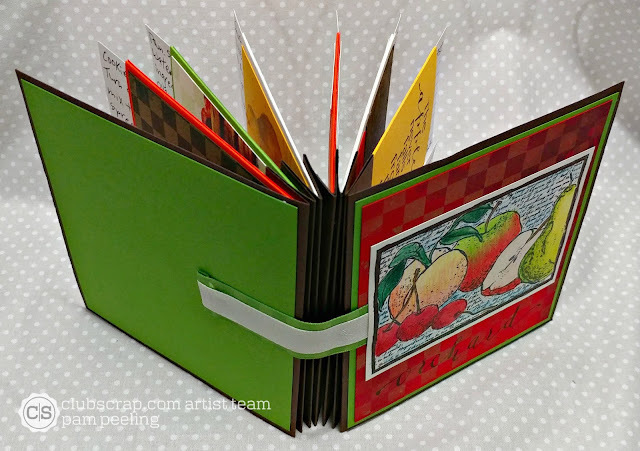 That recipe book with that clever binding is about adorable as it can possibly be! What a great practical combo! The clothespin recipe holder and recipe file are so cute! Great gift idea!